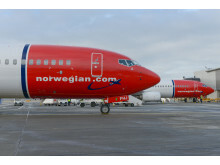 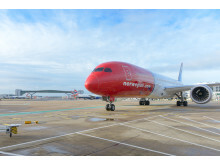 Norwegian celebrates 2nd anniversary of low-cost long-haul flights to U.S.
​Norwegian is this week celebrating the 2nd anniversary of its unique low-cost long-haul flights from the UK. 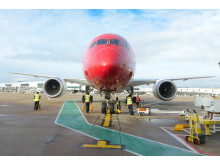 Low-cost airline Norwegian has reached 500,000 UK passengers on its ground-breaking low-cost long-haul flights to the U.S.
500,000th UK long-haul passenger Sam Holden (2nd from right)..
500,000th UK long-haul passenger Sam Holden (2nd from right). 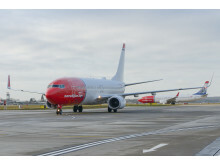 Norwegian’s ground-breaking low-cost transatlantic flights continue as San Francisco becomes seventh US destination. 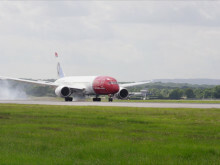 Norwegian has been named the most fuel-efficient airline on transatlantic routes in a study by the International Council on Clean Transportation (ICCT).